Last Saturday, Christine and me drove over one and half hour to the East of the Netherlands, to Eibergen, of all places, for a chocolate workshop. My friend Rachel had arranged this and we had no idea what to expect. It appears that Eibergen harbors an award winning chocolatier called Hulshof. 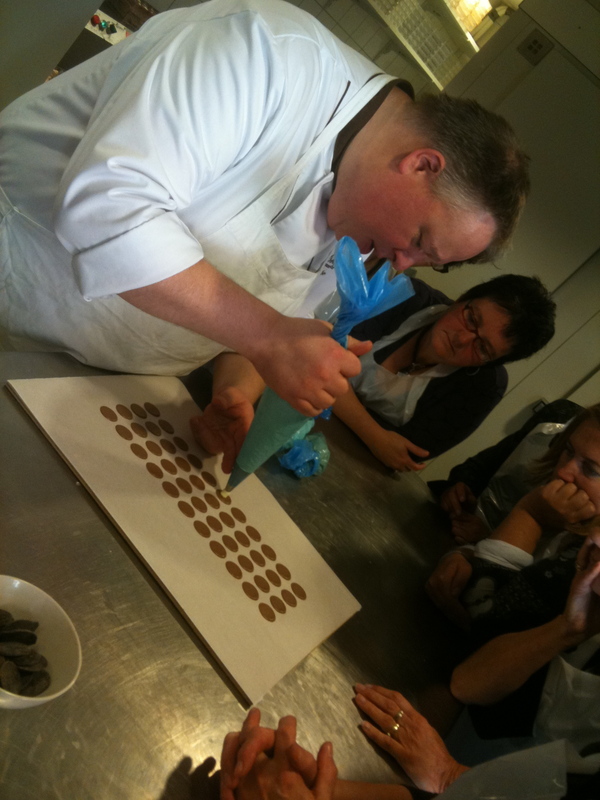 This chocolatier gives a variety of chocolate workshops and even chocolate tasting afternoons. We attended a workshop where we hand-made about 25 bonbons which we were allowed to take home afterwards, which was a definite extra plus! We spend 2,5 hours playing with chocolate and the total price of the workshop was EUR 40; a bargain. At arrival, the chocolatier explained us the origins of chocolate; the cacao bean but also the effects of terroir on the taste of chocolate. I had never realised that terroir has such a big effect on the taste of chocolate and that chocolate from different locations tastes different. We tried some white chocolate which had notes of coconut and was really excellent. 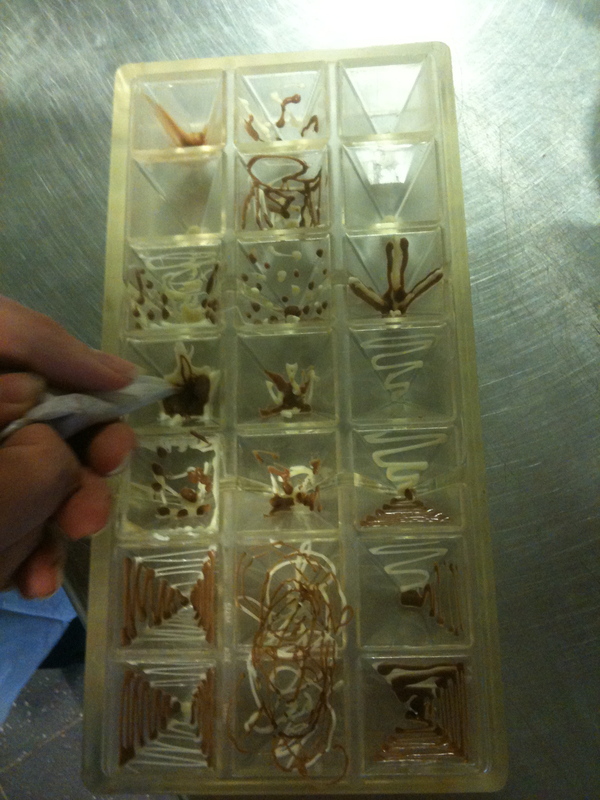 Then the chocolatier told us we could each make a mold full of chocolates. He showed us various decoration techniques and soon we were all off trying to decorate our bo nbons in a unique way. It was fun understanding how to make these patterns and it was even more fun trying to make them myself. Each of us stood there with the little piping bags filled with chocolate, tongue between lips, decorating our mold. Next step was that the chocolatier himself filled the molds with the chocolate of our choice, after filling it up he turned them around, so only the chocolate which touches the mold stayed in, creating a hollow space which could be filled with various available fillings: cointreau cream, pistachio cream, hazelnut cream, vanilla cream and caramel. Of course we could also use a combination of the fillings. The chocolatier then picked up our molds and topped them off with again the chocolate color of our choice to create the bottom of the bonbon. Next he showed us one more technique, he filled a sheet of baking paper with little round chocolate circles (he used a mold with round holes for this). Then with a piping bag filled with cream little rounds of cream were placed on top (this looked easier then it was..). Next to the baking sheet were two au bain marie pots filled with milk chocolate and one with dark chocolate. The idea was to drop the little rounds topped with cream in the chocolate and to fish them out again and place them back on the baking sheet. If you wanted you could then top off the chocolate with some decoration or nuts. When it was my turn, I managed to drop the bonbon multiple times in the chocolate, being too clumsy. But it came out eventually and looked good. The next one I tried did not want to leave the little fork I used to fish the bonbon out of the chocolate, so I had to use my fingers to push it off, creating some finger marks.. 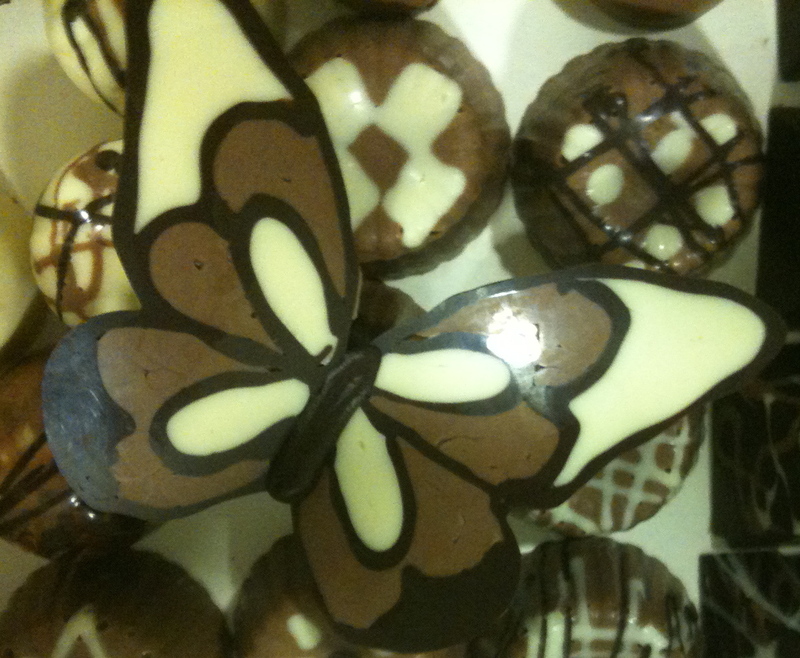 But all in all, these chocolates also looked good (and surely tasted nice!). It was a fun workshop, which I can definitely recommend. It’s not something I can now easily repeat at home, due to the material required, but it’s good to understand the decoration techniques, these can come in handy for decorating deserts. Also making decorations like the butterflies is relatively easy to do at home and the variations for this are unlimited.